A part of the table mountain national park, this memorial is dedicated to English-born South African politician Cecil John Rhodes. Located on the Devil’s peak of the Cape Town, the memorial has a magnificent view of the entire city; this aesthetically designed memorial is also the starting point for the hiking trail of the devil’s peak. Set in the forests of native and rare silvertrees, Rhodes memorial deserves a visit. Also, visit the popular attractions in the city by following Cape Town itinerary 2 days. You can engage in the number of outdoor activities like hiking when visiting Rhode’s memorial. Ideal for family picnics and day-outs. 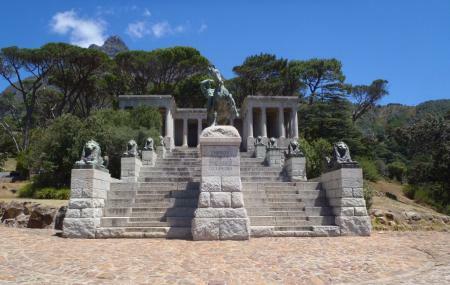 How popular is Rhodes Memorial? People normally club together Kirstenbosch National Botanical Gardens and Jewish Museum while planning their visit to Rhodes Memorial. People also prefer to start their day with Rhodes Memorial. There were some signs of vandalism which I suppose adds further interest to the memorial of such a powerful and controversial figure as Cecil John Rhodes. I must visit. An imposing memorial within a beautiful setting with great views with a quaint coffee shop next to it where a relaxing meal or coffee can be enjoyed. For the unhurried intellectual traveler. I recommend it. It's an iconic and sometimes divisive part of the Cape Town's history and culture. It's also an informal wedding photography venue because of the views over the suburbs. Great place to meet when planning hikes and the best bit? There's no entrance fee. Could be a bit more wheelchair friendly and toilets could be better too. A must visit if you are in town. The size of the columns and long stairs have made this memorial a hit for wedding photographers over the years and is still very popular to this day. The location makes it even more special due to the fact is is in the Forrest and has a magnificent views of the Cape peninsular. Great for hikers or outdoor fanatics that don't want to strain a muscle or cough blood (joking). You'll find lot of shoots being done here on weekends it's popular with couples. Great views of the city. Amazing restaurant up on the top. For hiking, running trails. For a good morning walk, then you head to the restaurant for breakfast. They offer breakfast and lunch. Prices vary on average R80- R120. Banting diets, vegan, not halaal. They offer desserts, sandwiches, nice portions and wide selection of teas and coffees. What a wonderful view.